This ministry is an Association of Catholics who, with the sanction of the Church and under the powerful leadership of Mary Immaculate, Mediatrix of all Graces, has formed themselves into a Legion for service to the pastor and the church. The object of the Legion of Mary is the glory of God through the holiness of its members developed by prayer and active cooperation in Mary’s and the Church’s work. MARY, Queen of Apostles Praesidium – Our parish ministry officially began in July, 2009. There are two types of membership. 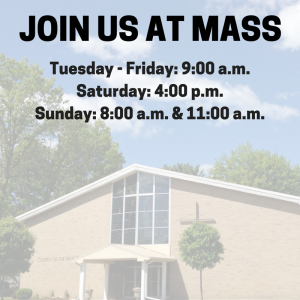 Active members meet weekly at 1:00 PM on Tuesdays to pray and support each other in our service to our parish. Auxiliary members share in the works and prayers of all other members by praying the Tessera and Rosary daily. Some highlights of our work include May and October Devotions to our Blessed Mother, promoting the Sacred Heart, visitations to parishioners and coffee hour after Mass on First Friday. For additional information or to join, please contact Annis Engel at 748-4095. Sunday 8:00 a.m. & 11:00 a.m.